In response to the October 2007 announcement in the Federal Register calling for comments about the existing guidance on expedited review, oral historians and their allies have flooded OHRP with complaints about IRB review of oral history and requests for an unambiguous exemption. As the original announcement noted, comments sent in response to Federal Register notices are a public record. Mr. Glen Drew and Ms. Toni Goodwin of OHRP kindly sent me copies of all 65 comments on expedited review. Of these, 38 commented on oral history or folklore, with all but one of those seeking exclusion for such research. The comments came from a wide range of scholars. University historians ranged in rank from graduate students to chaired professors. Non-university historians included those working for federal and state agencies and for private companies. Historians of science and medicine—among those most familiar with the medical research that led to the current regulatory scheme—were particularly vocal. The American Historical Association weighed in against IRB review—reversing its 1998 stance—as did the American Association for the History of Medicine, the American Folklore Society, and the Society of American Archivists. 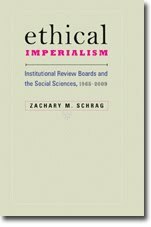 Scholars in sociology, English, psychology, medicine, and American studies also called for oral history's exclusion from IRB jurisdiction, as did one IRB chair. These scholars' complaints about IRB review of oral history will be familiar to those who have followed this controversy. Many noted IRBs' demands that scholars submit questions to be approved in advance, a practice that outrages oral historians who pride themselves on their ability to improvise questions in response to their research and the stories they hear. Of the 38 comments, only one did not condemn IRB jurisdiction over oral history. Yet even that comment, by Claytee White of the Oral History Research Center at UNLV, does not endorse IRB review as practiced at most universities. Rather, White notes that she spends only 15 minutes clearing each project, suggesting blanket approval for her work rather than the project-by-project review that is the focus of most complaints. The comments acknowledge that "memory can be painful," but they also point out that "historians are professionally obliged to ask our interview partners probing questions independent of the benefit or harm for the interviewee." Because they do not expect IRBs to understand this, historians—and the IRB chair—suggest that other oral historians would be better equipped to judge oral history projects than IRBs with few or no historians as members. The scholars do not think IRB members mean-hearted, just hopelessly unfamiliar with the practice of oral history. "University IRBs do not have the necessary background to appreciate that oral history research is different from other research involving human subjects," wrote one. Nor do they expect this to change. A historian of medicine notes that "as long as IRB members are active, overworked faculty volunteering their time, they will be unable to track the nuances of a style of research they see very rarely." For this reason, the historians do not seek modification of the current system, but an unambiguous removal of oral history from IRB jurisdiction. At least 14 comments, including the American Historical Association's, endorsed the 2006 recommendation of the American Association of University Professors "that research on autonomous adults whose methodology consists entirely in collecting data by surveys, conducting interviews, or observing behavior in public places, be exempt from the requirement of IRB review—straightforwardly exempt, with no provisos, and no requirement of IRB approval of the exemption." As I noted in my own comment, the present guidance was adopted in 1998 in response to six comments about oral history, one of which included the American Historical Association's endorsement of oral history's inclusion on the list of methods eligible for expedited review. Now that the AHA and 36 others have called for the wholesale exclusion of oral history from IRB review, I hope OHRP will be as responsive as its predecessor was a decade ago. Here are excerpts from the comments on oral history in PDF form.